Do you love Scooters? Polini? Wear your Favorite brand with pride with this awesome shirt. 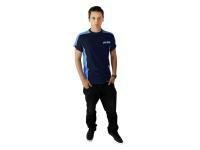 MST-298250 T-shirt from the Blue-Line series in the typical Polini colors with chest logo. Polini S.p.A. is an Italian manufacturer of tuning parts for motorcycles, mopeds and scooters. Among other products, they produce cylinders and variators for both racing and road use. Racing Planet is proud to carry the scooter racing range of Polini products. On our site you can find the greatest selection of the Italian brand.